CAP Talk | General Discussion | Uniforms & Awards | Topic: Cadet Semi-formal Dress Uniform (Old Style) with shoulder cord or without? Re: Cadet Semi-formal Dress Uniform (Old Style) with shoulder cord or without? But cadets can't wear mess dress. And seniors can't wear semi - formal. So its not really an "alternative" uniform for either membership category. 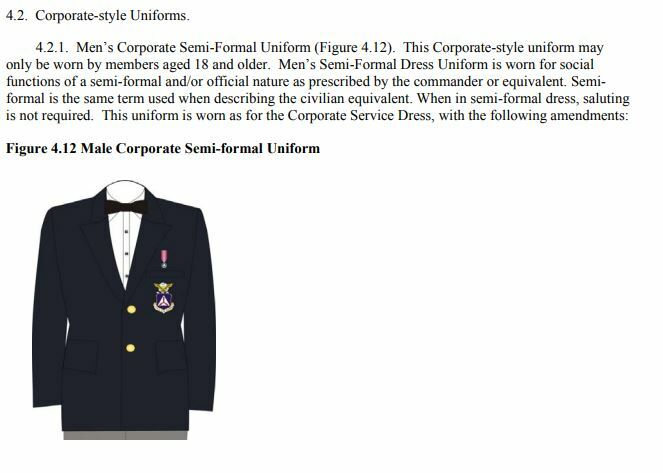 Semi - formal, for cadets, is the ]functional equivalent of mess dress. Not an alternative to it. Cords are not worn for mess attire. The CAP Semi-Formal is the cadet mess uniform. It can't be both. It's either a semi-formal version of a service uniform or it is a mess dress uniform.Ive seen nothing, anywhere, that refers to the semi-formal uniform as a mess dress uniform. Have you? It's not a mess dress uniform, otherwise it would be called that. That won't happen, because we already have one, and the semi-formal dress uniform looks nothing like the mess dress uniform. At BEST, it could be said that the semi-formal uniform is an alternative to the mess-dress uniform. Sort of like how Tofu is an alternative to meat. But try as you might, you can't call tofu by any meat name - because it isn't. It is both, because cadets don't have a mess dress uniform. Mess dress is for officers, whereas semi-formal is worn by enlisted (enlisted may also opt to purchase the mess uniform, which is a completely different style/cut than semi-formal). Semi-formal uniforms are the same blazer/service coat worn in Class As but with a different combination of accoutrements. If it's a tuxedo event...say, cocktail banquet...officers wear mess, enlisted wear semi-formal. In CAP, cadets (who traditionally wear the enlisted-style Air Force uniform) wear semi-formal, since that's the traditional enlisted mess uniform. Senior members (who traditionally wear the officer-style Air Force uniform) wear mess dress. It makes perfect sense until you start to look at senior member NCOs, who don't have a mess uniform mentioned in CAPM 39-1 (although, they would traditionally wear their service coat in semi-formal combination...unless they purchase a mess uniform). If we really want to get particular here, the whole basis is to maximize uniformity and minimize cost in an organization that has H&W standards for seniors but not for cadets, so seniors have two uniform combinations, whereas cadets do not. Cadets have one uniform they wear so that as they progress, they don't have to purchase a bunch of other stuff. Just as cadets don't get flight caps with silver braiding or Class As with sleeve braids. There's a reason why we don't see a lot of semi-formal events: it's a universal PITA. Few cadets have semi-formal attire. Few seniors have semi-formal attire. None of us get a clothing allowance. @#$%. I meant USAF-style semi-formal. Looks like this is one situation that would allow cadets (aged 18+) to wear a miniature medal. Right? I may be wrong here, but only if they don't meet height/weight standards. Cadets are required to wear the USAF style uniform unless they're overweight and even then must still adhere to grooming standards. Yes sir, I thought that was addressed by the post above mine. I had to look into this recently as I have a cadet turning 18 this year who will likely be in corporates. Be prepared to get some flak for it if you make your 18 year old cadet start wearing corporates. It isn't done that often and the "experts" will say you can't do it. Be gentle with them for they are misguided, misinformed and just plain wrong. Not to side track too much, but I appreciate that this is a consideration BEFORE cadets turn 18. It helps to be a little proactive in reminding them: "Hey, you're turning 18 soon. So let's go over some things here, including the uniform..."
It's an awkward conversation that people just don't want to have, because the end result will go one of two ways: they're offended/upset, or they're motivated to drop weight. Seniors CAN wear "semi-formal." In fact, there are two exceptions: 1) NCO's and 2) All SMs - but It just looks different than the "cadet Semi-formal." (It's the blazer, which leads to another issue - blazers aren't considered to be civilian semi-formal. Semi-formal in civilian terms would be a tux. But that's another story). Yes, I like the bit about "functional equivalent" as opposed to my "alternative." But functional equivalent can only mean for purpose or occasion, and doesn't determine what items are removed. With the language already cited that the semi-formal is worn in the same manner as the service coat, but minus the SPECIFICALLY mentioned nameplate and the SPECIFICALLY mentioned swapping out of the blue shirt and blue tie to white shirt and black bow tie, there is NOTHING that says that the shoulder cords need be removed. Mess dress is for officers Senior Members , whereas semi-formal is worn by enlisted (enlisted may also opt to purchase the mess uniform, which is a completely different style/cut than semi-formal)cadets. I was referring to military, not CAP (which I hit after the initial point on traditional wear). I think we've about run the course on this one. The question was asked, some folks answered, the reg is fairly inconclusive and open to interpretation.